On the twelfth day of Christmas my true love gave to me: twelve I CAN’T BELIEVE IT TASTES LIKE BLACK VELVET!’s, eleven HYPER CLOCK UP’s, ten EVERYTHING FOR BIG FIRE’s, nine SKULL MAN’s, eight SYNAPSE ATTACK’s, seven GARO’s, six OH GAWDS YUNO IS MOE!, five ZERO!, four VOLTEKKA!, three PRIMAL SCREAMS OF HOT BLOODED FURY!, two(million) RONs!, and one GIGA DRILL BREAKER! This is the twelfth post in a series as I look at the twelve best anime moments of the year from shows I watched. Key there being watched, as a few of these moments are going to be from some pretty old stuff, but I think they’re damn good enough to talk about at any time. This is a joint ABC blogging project with other contributions from Roxas, CCYoshi, Orion, Owen S, Xerox, Nekoron, Martin, Michael Huang, usagijen, and Moogy. Yeah, there’s a lot of us. So here we are at the end of this little summary of my awesome moments of the year, and what better way to celebrate christmas than with the greatest anime christmas episode ever? Yes, I’m talking about the christmas episode of Bartender. It’s no secret around here how much I love this show, and my favorite episode is definitely the christmas one. It’s partly because I love christmas and partly because it’s a very well put together episode. 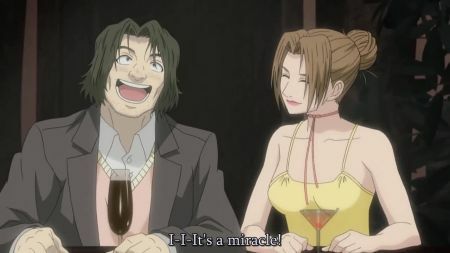 It has everything: a hapless protagonist looking for love, unique direction, crazy bartending action, and even a christmas miracle. Like every Bartender episode it soothes my soul, while also imbuing me with a bit of christmas spirit, even if I’m watching it in the middle of summer. Of course the strength of Bartender has always been in that soothing feeling, no matter the season. There’s never a wrong time for a Glass of the Gods.